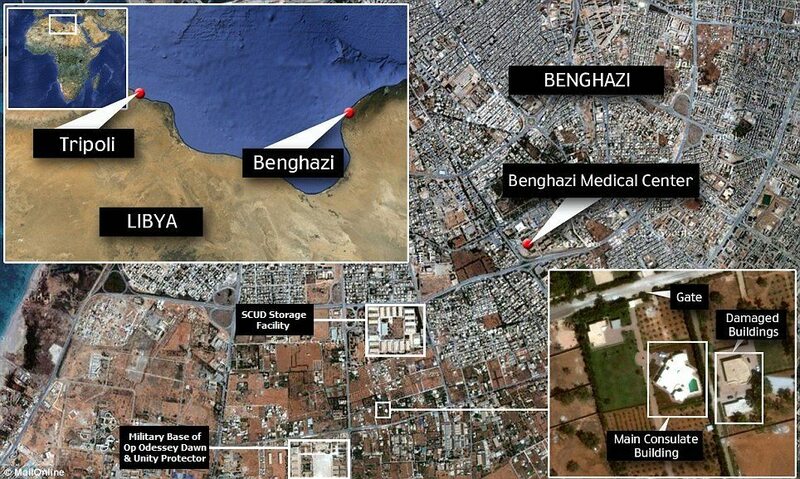 Last September 11, 2012, al-Qaeda affiliated jihadists attacked our consulate in Benghazi, killing our ambassador and three others who disobeyed orders to stand down and died trying to defend him and his staff. Yet on the night of the attack, Obama failed to order a rescue mission, went to bed, and when he awoke, flew off to Las Vegas for a campaign stop as if nothing out of the ordinary had happened. The attack had been an act of war. The president’s actions were very likely a dereliction of duty, an impeachable offense and had the effect of making elements of his own military begin to conspire against him. 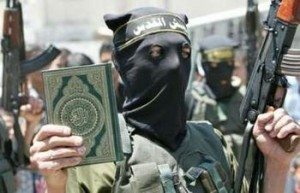 Al-Qaeda soldier holding the Quran during a rally. In the cold war, when national security experts spoke of strategic as opposed to tactical nuclear weapons, the word carried huge weight. In the case of a weapon, it refers to one designed to destroy the military potential of an enemy. On August 31st the AP reported from Cairo – “Reeling from a fierce security crackdown, the Muslim Brotherhood brought out mostly scattered, small crowds Friday in its latest protests of Egypt’s military coup. 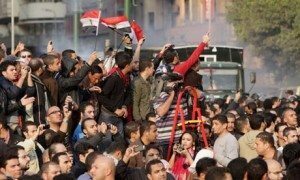 While the remnants of the Brotherhood’s leadership are still able to exhibit strong coordination from underground, the arrests of thousands of its supporters and members – and the fear of more bloodshed – have weakened its ability to mobilize the streets. In short, the Egyptian Revolution 2.0 appears to be holding. In a stunning series of events, Egyptians by the millions flooded the country’s central squares and, in 2011, brought about the abdication of their Dictator for Life, Hosni Mubarak. Next the first freely elected leader in Egypt’s 6,000 year history, Muhammad Morsi, assumed office. But in less than 24 months, millions of Egyptians returned to the streets and, with the help of the military, deposed the hapless Morsi regime. The Egyptian model for regime change involves two elements—,one, millions of angry disaffected citizens flooding and staying in the citadels of power, demanding that the regime leave office and, two, a military which sides with them. Given the stunning success of the Egyptians, two regime changes in 24 months, I would ask—now that we have seen insurrections by disaffected youth in Greece Turkey, Tunisia, Egypt, Brazil and Chile, why won’t the Egyptian model come ashore in the US? All the underpinning elements are present here. 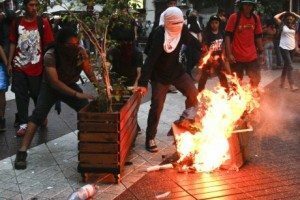 You undoubtedly didn’t hear about the recent youth insurrections in Chile. Due to social media, youth insurrection is becoming a global phenomenon. A month ago, my eldest son and I had an eight hour layover in the Santiago airport on our way back to the States. On overhead television monitors in our airport restaurant we watched live television coverage of pitched battles between riot police and angry throngs of students fighting in the capital’s streets. While neither side was firing guns, they each were armed with clubs and truncheons and the fighting was desperate and intense. We saw dramatic footage of large throngs of students beating back outnumbered police and individual footraces ending in a policeman tackling a student, clubbing him mercilessly and dragging him off to the waiting paddy wagon. I asked our waiter why the students were rioting. “They say that the education is too expensive and it is useless because there are no jobs,” he told us. But the fact remains, young Americans are suffering a similar situation as are their counterparts in Chile or Egypt. Young American college graduates, most of who voted for this president, have every right to feel betrayed. Due to lousy government policies and the impending implementation of Obamacare, the real unemployment rate among young Americans under 25, is over 20%, if you count those who are so discouraged that they have stopped looking for work. But it’s much worse than that. 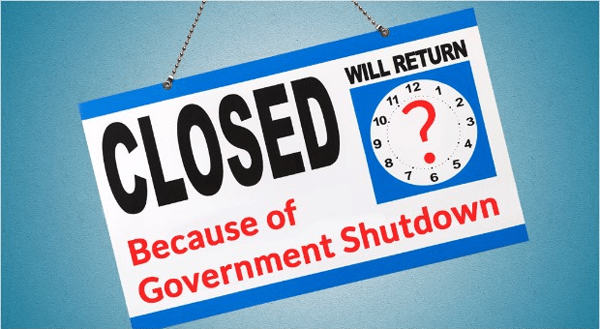 Due to the perverse incentives of Obamacare and our regulatory state now on steroids, over seventy percent of the jobs created during the last 12 months are part-time jobs. This negates the American dream for millions of our young. So let’s do this thought experiment: Imagine a recent college graduate, Bob, who feels that he’s worked hard and mostly played by the rules but finds that, in order to pay off his student loans and to afford a crappy studio apartment, he’s got to work two part-time jobs at Wal-Mart and Taco Bell. Now imagine that Bob finds out that Obamacare is going to force him to buy a healthcare policy he doesn’t want or be forced to pay a fine. Bob thought, based on all that Obama said, his health care was going to be free! On top of that, he learns that there is no global warming but his government has made gasoline prices so high, he can’t afford to drive or own a car. Now let’s imagine Obamacare is fully implemented and Bob gets a call from an IRS agent letting him know that his pay will be garnished if he doesn’t pay the over-due fine he owes for not buying a government-sanctioned health-care policy. And let’s also imagine that Bob realizes that the threatening IRS agent along with his Marxist college professors who taught him to hate his own country earn much more money than he does, while working far fewer hours and will retire with gold-plated pensions that Bob has no hope of acquiring. If millions of young Americans come to realize the enormity of their betrayal, won’t that be the tipping point? So How Might the Military Side with the Millions of Insurrectionists? In July of this year, at the Panama Canal, Panamanian drug agents boarded a North Korean cargo ship returning to Korea from Cuba. On board they discovered Cuban SA-2 surface to air missiles. While his crew desperately fought the boarding agents, the North Korean captain committed suicide. 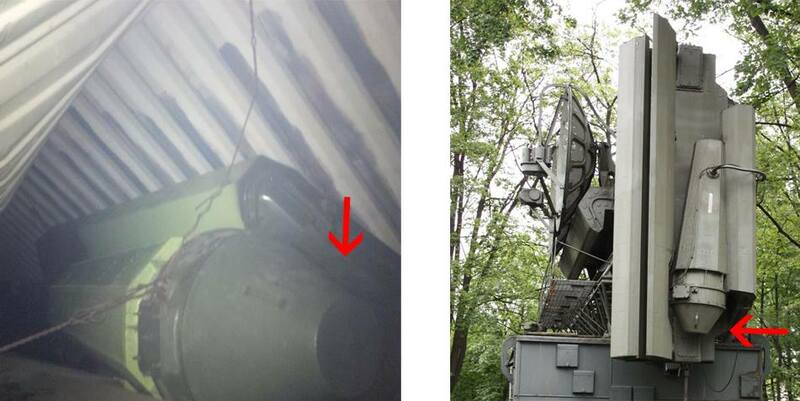 Seized Cuban SA-2 missels from North Korean Cargo Ship. Passenger aircraft flights between Tehran and Caracas Venezuela continued to increase. Once the Iranian aircraft are on the ground, satellite photos reveal that the aircraft contain no passengers. Instead, they are met by forklift trucks which off load vast numbers of unmarked containers, off-loaded onto awaiting government trucks and driven deep into the interior. 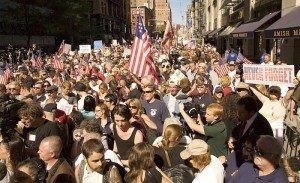 If we see millions of disaffected Americans flooding the streets of DC, we can also imagine two other existing phenomena that could cause the American military to intervene in the protestors’ behalf. Add to that, in order to inflict maximum pain during the government shutdown, the administration ordered the National Park Service to fence off the World War II Memorial and other public monuments in the nation’s capital, threatening those who entered with arrest. This closure meant World War II veterans who had traveled great distances were initially denied access to the memorial. Many in the military were certainly outraged. With his loss of authority over his own military as a backdrop, we can imagine the consortium of Russia, Iran, North Korea, and Cuba, watching the chaos swirling around this president and decided this was the time to act. “We would like to announce to the nation, to the protestors in our Capital, and our allies around the world, that the Obama family is in a safe comfortable compound. They will not be receiving or making phone calls until new elections have been concluded but their children are with them. In short, the US military will attend to their every need until new elections are held and a constitutional government restored. The back story instantly leaks out and becomes viral globally. Amid the chaos swirling around him, watching the wreck of his presidency, when this president is briefed about an impending new Cuban Missile Crisis, he fails to act. As was the case in the original Cuban Missile Crisis, unmistakable intelligence is delivered to him that shows Cuba and Venezuela preparing to load onto primitive barges retooled launchers and SA-2 surface-to-air missiles equipped with nuclear warheads. The plan is to sail those barges into the Caribbean and Atlantic and while still in international waters, fire the missiles over the US homeland and detonate them at apogee. Experts tell the president that this EMP (electromagnetic pulse) attack will knock out our entire electrical grid, rendering every computer in operable and therefore all commerce impossible. The loss of life would be near total in the vast foodless Armageddon that was America. Still he does not act. As did Egypt’s General Abdul al-Sisi, we can imagine that Dempsey would inform Americans and the world there would be an interim executive branch and acting president appointed to rule until the congressional and presidential elections were held and concluded. Moreover, every member of Congress would need to stand for reelection whereas the fate of the current president and his vice president would necessarily need to remain vague. And with that announcement the millions of protestors gather up their camping gear, pick up the trash around their capital city and go home. And with that, the enormity of what they had done would only begin to sink in.